Think of it as an "apartment off the rack." When you think of Daffy's, you probably think fashion. But, this summer, the discount chain is offering its customers the unique opportunity to win a 10-month lease on a West Village luxury apartment for a mere $700 a month. That same apartment would go for $7,000 a month on the market. 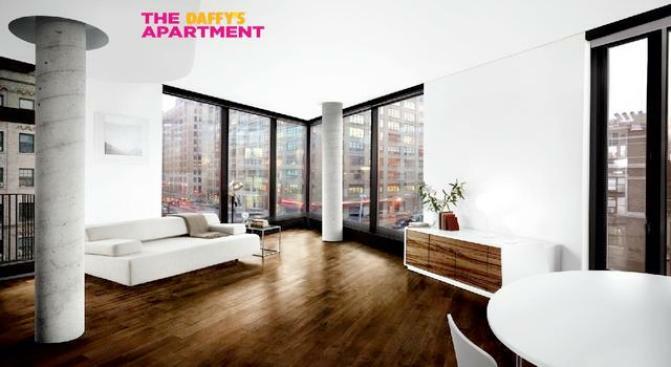 To enter the promotional contest, go to certain Daffy's stores, and make a 30-second video on why you deserve to win "The Daffy's Apartment." The contest starts July 23 and runs through August 14. At that point, Daffy's will choose five finalists whose videos will be posted on their Web site. The public will be able to vote on the final five from Sept. 7-16. The winner, who will be announced by Oct. 1, will move into their luxury apartment at One Seventh Avenue in the West Village. Daffy's is hoping this contest will both appeal to their regular customers and gain them some new shoppers. It's a great way to create curiosity in these times of economic doldrums, said Will Bracker, Marketing Director, who touted Daffy's "deep discounts on quality merchandise."